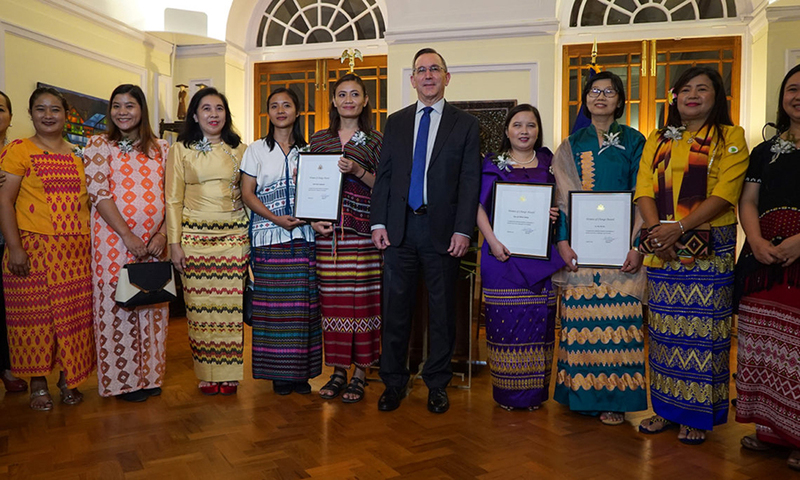 CHIANG MAI, Thailand – The U.S. Embassy in Yangon honored two Myanmar women and one local organization with its annual Women of Change Award on Thursday, recognizing the “incredible work” that they and so many women are doing to advance the rights of all people in the country. The 2018 recipients were the Karen Women’s Organization (KWO); Daw Aye Thinzar Maung, an executive committee member of the Myanmar Federation for Persons with Disabilities; and Dr. Thet Thet Mu, the deputy director general for health information at the Ministry of Health and Sports. They were honored for their expertise in diverse fields including public health, women’s leadership, and the rights of indigenous people and people with disabilities. The award recipients told The Irrawaddy that this recognition of civil society groups would help to make more people aware of their efforts and encourage others to stand up for change in Myanmar. An ethnic Karen women’s group formed in 1949, the KWO operates from a base on the Thailand-Myanmar border and is dedicated to empowering women. It pushed for increasing women’s role in decision-making within the Karen National Union (KNU), and has been a strong voice for gender equality and indigenous people’s rights. Disability rights advocate Daw Aye Thinzar Maung was recognized for her role in raising public awareness about equal access to education and job opportunities for people with disabilities. According to the 2014 census, Myanmar has about 2.3 million disabled people, or 4.6 percent of the total population. Daw Aye Thinzar Maung was born fully abled but was later diagnosed with a disease that caused her to lose her sight. She worked as a trainer with the Association of Myanmar Disabled Women’s Affairs (AMDWA) before becoming a leader in MFPD. The embassy said Dr. Thet Thet Mu was being honored for leading the “use of quality health data for evidence-based policy and decision making.” It cited the fact that in 2015-16 she led the first-ever demographic and health survey (DHS) to fully reflect Myanmar’s geographic and ethnic diversity. 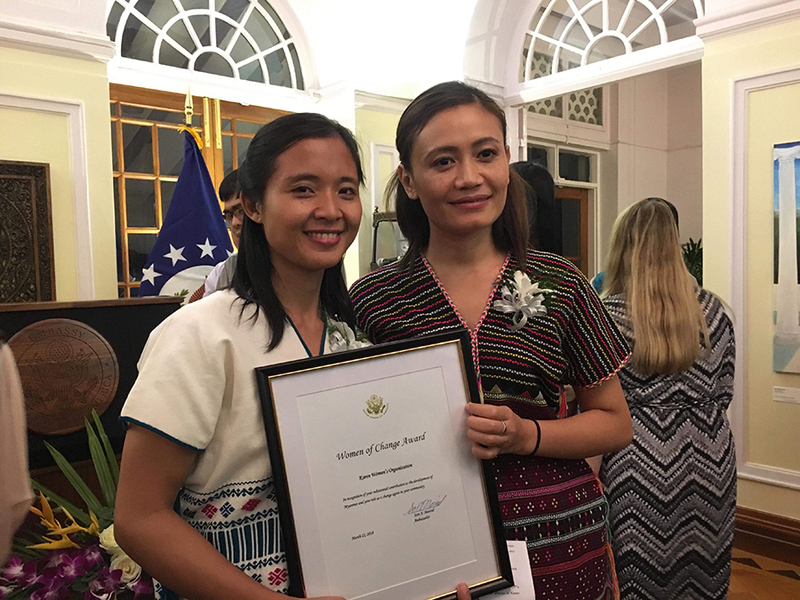 The US Embassy first awarded the Myanmar Women of Change Award in 2017. There were six recipients last year: Mai Mai of the Kachin Youth Organization; Daw San San Maw of the Myanmar Red Cross; Naw Ei Ei Min of Promotion of Indigenous and Nature Together; Daw Hla Hla Ye from the Legal Clinic Myanmar; Dr. Khin Chit of the Ministry of Health and Sports; and Daw Yi Yi Cho of the Ministry of Natural Resources and Environmental Conservation.